Geez these weeks are just flying by. You don't have enough time to appreciate everyones work before it's time to start another challenge! Soooo are you ready for challenge #7?? This week the GroovyGurlz were to let the below picture inspire us while creating our work of art! For my project this week, I decided to finally overcome my fears and try the Easel Card. You can find a tutorial HERE at SCS. I know Kym, aren't you so proud of me?? I finally did it!!!! lol I have to say they are pretty fun to make and can see how folks can get addicted to making them. 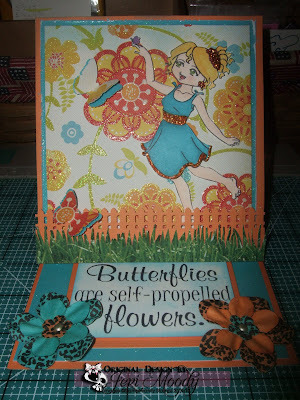 So here is Morgan and the Butterflies sentiment from the Springtime Morgan stamp set that can be found at Stamp Happens. by linking your project HERE! 1. Each time you enter a challenge for the month, you will receive one entry into an end of month drawing for a free digi of your choice. If you use an SIS image, you get another entry. The drawing will be done on the first day of the next month. 2. Then, the top 3 entries each week will receive an “I grooved with the Gurlz” badge to display on their blogs. We’ll distribute the badges on the day of the new challenges. Be sure to check out the rest of the Groovy Gurlz for more inspiration! We can't wait to see your groovy creations!!!!! Phew!! Please forgive me for being late but I've been grooving to high school projects with my youngest son!! Sheesh I'll be glad for summer to get here. Soooo are you ready for challenge #6?? 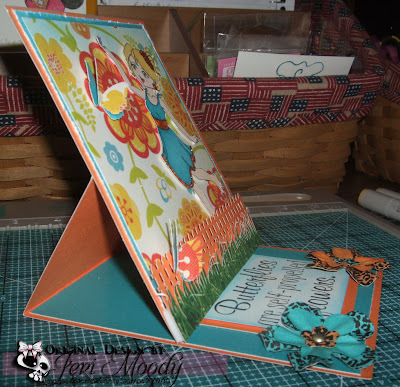 This week the GroovyGurlz were asked to create and/or alter a box or frame! My oldest son's girlfriend more or less chose my project for me! She found a frame that I had and asked me to use it and put a picture of my son in it. The only problem was the color she wanted it painted..lol HOT PINK!!! For all those know me, I don't do PINK of any shade well lol and my son definitely didn't want his picture going into a PINK frame, BUT she won!! 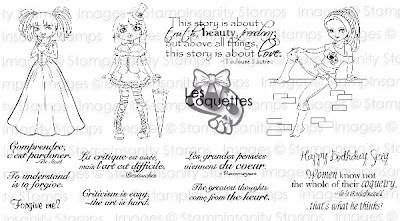 So here he is with Nicholette from the Les Coquettes stamp set that can be found at Stamp Happens. Anyways, I tried to add some black to it, to make me and him happy lol but she requested that I not do too much to it, so I tried to do as she asked. The sentiment, I came up with in my head and generated it with my computer. Colored Nicholette with my Copics, and added some "Say It with Bling" along the edges. The frame was painted with a Hot Pink Acrylic Paint. Besure to check out the rest of the Groovy Gurlz for more inspiration! We can't wait to see your groovy creations!!!!! I'm so excited to be posting today as a Guest Designer at For Fun Challenges!! I was honored when Helen asked me if I would be interested in coming up with a challenge for this week. Be sure to head over to For Fun Challenges every Wednesday for a fun and new challenge! For this weeks challenge I chose to do "Anything But a Card". I love doing altered projects, so when Helen told me that I could choose anything I'd like as the challenge, I knew exactly what it had to be!! With Mother's Day right around the corner, I chose to do a paint can for a friend to let her know how special she is and that she's being thought of. Hopefully you'll see how easy it is to make one, and you'll make one for someone special in your life also!!! They're so fun to make and you can be as creative as you'd like with them!!! I made the paint can pattern using my Cricut Expression, Design Studio and the Storybook cartridge. 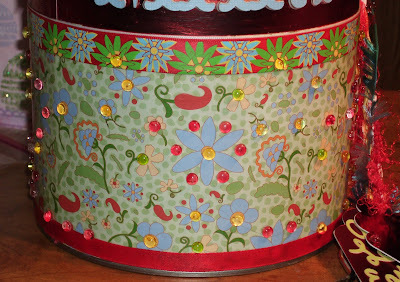 If anyone is interested in the paint can pattern .cut file, feel free to email me at Jeri@SewManyChallenges.com. I have it available in Plantin, George, and Storybook cartridge. The name on the can was done on the Cricut with the Storybook cartridge also. 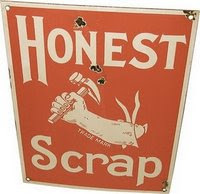 But you could use any stickers, chipboard or lettering that you have in place of the work done with the cutting machine. My papers came from the DCWV Citrus Stack. I used clear skittles on the patterned paper for the middle of the flowers to give depth but to take the color from the paper. 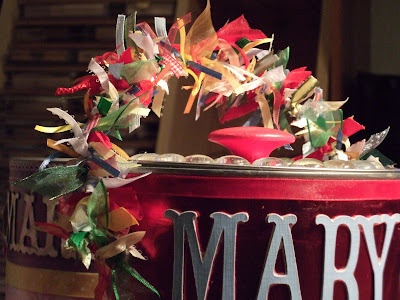 I used various ribbons that I either had in my collection or in my stash to use along the handle. 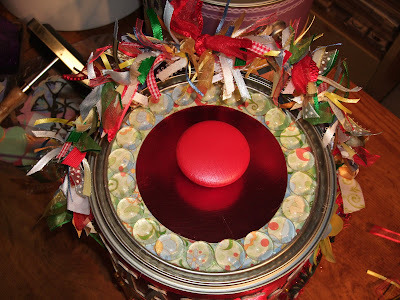 The lid is covered with the same patterned paper from the can and layered with a piece of the metallic red cardstock, then clear pebbles hot glued around the rim. The knob is a regular drawer knob from Home Depot, painted with metallic acrylic paint and then hot glued to lid. I attached the tags and lid opener to the handle using various fibers from my collection. 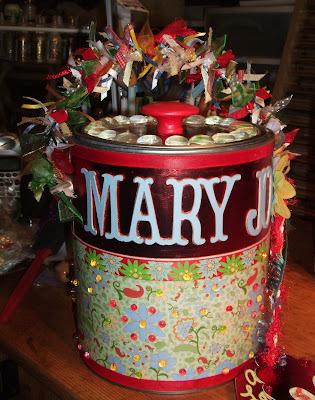 And then you can fill the paint can with all sorts of goodies that your special person loves!!! I absolutely love doing these and hope that you'll try your hand at one also one day!!! We've got a new challenge for you over at Sew Many Challenges! This week we have a dual theme challenge. Using the sketch below, create a project with a Mother's theme! It could be a new mom, grandmother, mom, however you may interpret it! 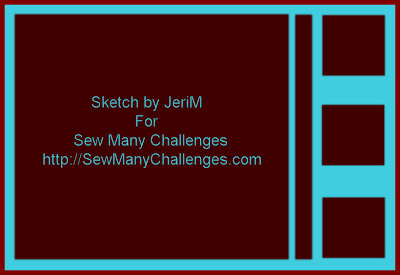 Be sure to check out Sew Many Cards for some awesome images to use on your challenge! You have until Thursday, 11:59PM EST to submit your project link HERE! This is what I've come up with for this week! I'll be sending this to my mother in law, who is a seamstress, so I think it's very fitting for her. I think she'll get a kick and a smile from it. All the papers came from the DCWV The Crafty Stack. I used some random buttons that I had in my stash. I took some floss thread and spun it around the spool that comes with the image. The sentiment is computer generated using the Topstitch Font. I went back later and added Glossy Accents to the tips of the antennas, nose and Cammi's eyes. I used my copics to color her. We hope you'll join us this week!! 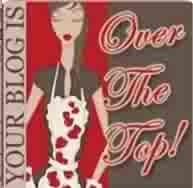 Don't forget to check out all of our DT's creations by checking out their amazing blogs, which you'll find in my left sidebar or by watching our slideshow at the top of the Sew Many Challenges Blog! 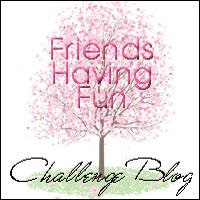 Welcome to the first Friends Having Fun Recipe Challenge!!! Once a month we will be bringing you a special recipe for you to work with and see what you can cook up!! Don't limit yourself to what you come up with! It can be anything that you can fit the recipe to, so lets see what you can create!! Ok so here's my project that I came up. My shiny is found on my image..."Pearls and Leather" by Stitchy Bear Stamps. I colored it with my copics using V12, V15, and V17. I used InkEssentials Glossy Accents and Lavendar Lace Liquid Pearls. You can see it a little better in the picture below. I've also got shine through one of my patterned papers. The three patterned papers I used are from DCWV All Dressed Up paper stack and Me & My Big Ideas Black & White Specialty Cardstock stack. The sentiment I used is computer generated. "They say money doesn't buy HAPPINESS! Apparently they're shopping at the WRONG stores! "I love this saying because it's soooo true!! On my worst days, even if it's only for five minutes, I can go into a store and come out a happy girl!! We hope you'll join us in this month's recipe challenge. 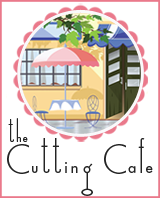 You have until next Saturday, midnight EST to submit your recipe project HERE! Hope everyone's ready for another Groovy challenge this week!! 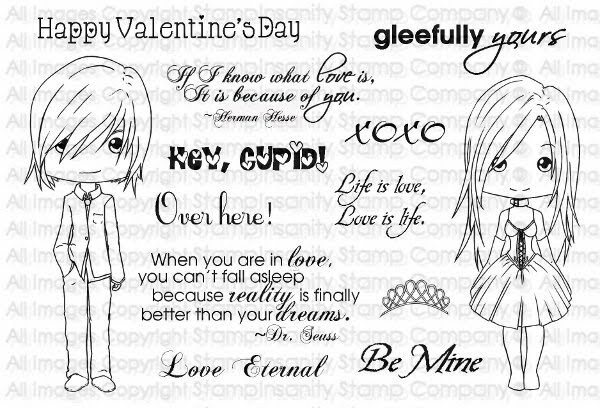 The GroovyGurlz at StampInsanity would love for you to join in with our sketch challenge this week!! Just take this sketch you see directly below and come up with the grooviest creation that you can!!! For this weeks challenge I chose to make a card for my niece that will be graduating from high school next month. I guess I could've gave it to my son for his graduation next month but don't think he'd like it too much or find it funny lol Anywho...I can remember me and my sister being pregnant at the same time, me having my son first, and then a few months later it was her turn. I can still remember the day she was born. It's so hard to believe that my son and her daughter are now graduating high school next month. I'm anxious to see where their adult paths will take them. I'm so proud of both of them and wish them both the very best in the new phase of their lives. We hope that you'll join us this week! Did you know that if you enter the challenges, that you could win a free digi? 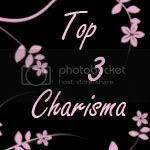 And that the top 3 entries get a special badge? So are you ready to get GROOOOVY with us?!?! Then lets go!! Share your creations with us by linking your entry HERE and using the challenge code SISC5. Be sure to check out the rest of the GurlZ for some rockin' inspiration and creativity!!! 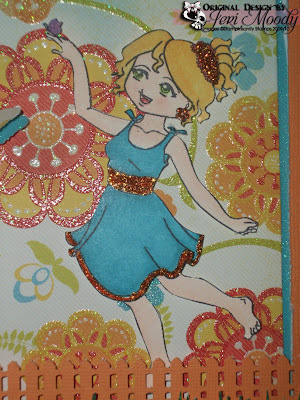 StampInsanity - Maddie - From Zeke & Maddie Collection and my copics! And these were used on Lita! It's time to get GROOVY with the Gurlz at StampInsanity!! Challenge #4 has started and we're challenging you to make a stair step card!! You can find an easy to follow tutorial HERE. So here is my card this week!! I went with Joszette from the Les Coquettes set. I just had to play with her. I think these flirty ladies are just the cutest, so I couldn't let Joszette get jealous by playing with Nicholette and Pierrette and not her! So here she is....I hope you like!!! Share your creations with us by linking your entry HERE and using the challenge code SISC4.